Hahaha, I guess it was too easy. I like it! Really goes with the skin. Subtle. I was going to guess the Dior also! It took me a second to decide, but I think I really like it. Its sophisticated. I felt the same way about the China Glaze camel color that came out last fall...it was either icky or stunning! I like it! I want to say Caramel instead of Camel. I have a really similar color.. I thought I was buying a taupe polish but nope, turned out to be beige! >.< I actually think it's not too bad, it's a good work safe color. I don't like it on you.Looks muddy. Its not something I would wear, its a bit bland! I think I gained a pound from your virtual brownie offer. :-) I think it's a great subtle color if you need something subdued, but it wouldn't be something I personally reach for. Your nails look great, but this isn't my favorite color on you. I think it will depend on what else you've got on; I think with a coordinating (or perhaps contrasting?) outfit it would look good, but otherwise...I don't think it's the best color for you. Bit too yellow for your skintone, I think. 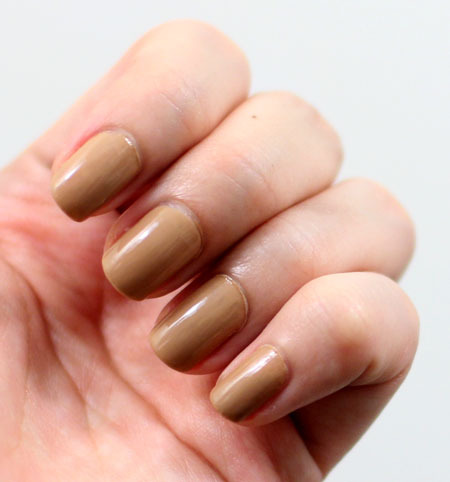 Normally, I don't think it makes any difference and one ought to wear whatever nail polish pleases one, but nudes are an exception. I agree with everyone who says that it is not flattering. nope. you need a lighter shade of beige - lighter than your skintone- and then it will look super.